Costs – Learn more about the costs to remove, maintain and handle stumps in Lexington, Kentucky. FAQs – Do you know current hazardous diseases to trees in Lexington? Some trees to avoid or lean towards planting? Find more information here. Services – Don’t waste time flipping through a phone book. Get a pro near you immediately. How Much Do Tree Services Cost in Lexington? Tree removal and maintenance services in Lexington can increase the value of your home and enhance the safety and appearance of your property. Trimming and removing trees due to age or disease can make way for additional trees or an addition to the property. Below are the average costs for tree removal and maintenance for the city of Lexington. The city of Lexington, Kentucky, has a mean average cost of $360 per tree removed. Smaller trees cost closer to $160 per tree, and large trees can cost upwards of $750. Lexington requires the removal of living trees in municipal areas that pose a risk to power lines and city utilities. Other trees may be too close to residential or commercial structures. Many trees will leave large stumps in their place after being felled. Stump removal requires a grinder to flatten the stump at ground level and costs between $80 and $150 depending on the size of the stump. The type of wood will also affect the cost. Denser hardwoods may take more time to grind. Tree maintenance consists of pruning and cutting limbs. It also includes removing debris after storms and regular maintenance. The cost is a combination of hourly wage and the dead weight of the limbs for hauling away. Lexington customers will usually pay an average of $250 for pruning, tree trimming and branch cutting. The cost is dependent on the size and complexity of the job. The typical range for maintenance is between $180 and $300. Lexington is home to a vast amount of tree species. The temperate climate plays a role in the diversity of this area. However, many people are unaware of tree species that may be invasive or governing rules that Lexington has in place to protect the city and other forms of vegetation. Here are some tips for better tree maintenance in the area. The city of Lexington has regulations about public and private property in regards to tree planting. It is illegal to remove or plant a tree located in a public street right of way without a proper permit. The Lexington Street Tree Program has an approved list of trees as well as permit application for planting trees on properties that face city streets. Lexington requires removal of trees that encroach on power lines. If the tree is not removed, the local county will usually remove the tree and charge the resident for removal. A moderate concern of Lexington is drought and high winds. Shade trees may need to be staked in early growth, and they need to be given lots of water. Improperly mulching a tree can damage the trunk and possibly prevent adequate moisture during hot seasons. The best time to plant a tree in Lexington is during dormant season. This is after the leaves drop in October and November. The state tree of Kentucky is the poplar. Its scientific name is Liriodendron tulipifera. It was a state consensus to give the title of state tree to the poplar in 1974. The poplar, coffee and tulip tree are the most popular trees in the state. Kentucky has a lower elevation and is more susceptible to sharp seasonal changes in temperature. There are 60 trees native to Kentucky. 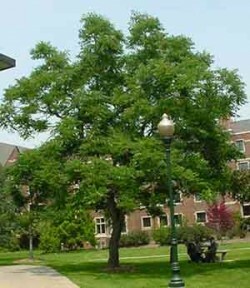 Other trees that thrive well in Lexington include the honey locust (Gleditsia triacanthos), white oak (Quercus alba) and sugar maple (Acer saccharum). These trees are also common shade trees in streets and large yards. The tallest type of tree in Kentucky is the tulip, and the shortest trees are the dwarf and semi-dwarf apple and peach trees. Trees that cannot handle heavy frost and freeze cycles. Kentucky is warmer in general than the rest of the Midwest. However, the area of Lexington does receive frost cycles in the winter. Avoid planting tropical trees and citrus trees that cannot handle frost. Non-native maples and hardwoods. Norway Maple and Black Walnut are considered invasive in Lexington. These trees can produce a sap or tap root that makes it difficult to grow many types of plants under their canopy. Ash trees. Ashes attract borer insects and Japanese beetles, and they invite verticillium wilt from the fruit that gathers in the spring. 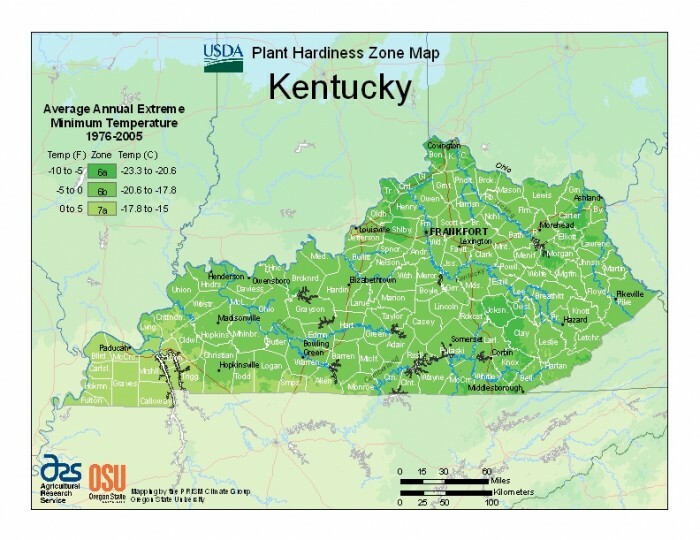 Lexington, Kentucky, falls in the growing zone of 6A. This is a slightly warmer Midwestern range of temperatures. Lexington has an average low of minus 10 degrees and an average first freeze date of October 21 to 31. The last frost occurs between April 11 and 20. Spring planting typically occurs during the first week of May. April is when most trees begin to bud. Some of the most common pests on trees are aphids, fruit worms and borer insects. Borer insects thrive in hardwood and will attack the plant through the sap that is common in maple trees. Aphids and fruit worms affect fruit trees and may require the attention of an arborist to determine the best way for removal and prevention. Aphids are common with ash and flowering trees because of the small fruits the trees produce. Japanese beetles are a common problem in areas with heavy vegetation. Many homeowners who grow vegetables or edible plants may find Japanese beetles. These insects can infect both the lawn and small flowering trees in the spring, which is when plants are most vulnerable.